Early in his career, James Cameron was a genius of parsimony, making his feminist science-fiction shoot-’em-ups The Terminator and Aliens appear more lavishly funded than they really were. Starting with 1989’s The Abyss—Cameron’s flawed-but-thrilling adventure set on and around an underwater oil rig, and the first of his films to incorporate his lifelong fascination with the ocean—each of his features produced a substantial technological advance. Most recently, he and Australian engineer Ron Allum designed a one-of-a-kind “vertical torpedo”-shaped submarine. It’s the only vessel in existence capable of withstanding the 16,000-pounds-per-square-inch pressure exerted at the bottom of the Mariana Trench—the deepest part of any ocean, a place vertically farther than from sea level than the peak of Mt. Everest, by a margin 2.5 times the height of the world’s tallest building. (Or “really deep,” to quote one of the Navy SEALs in The Abyss.) Cameron’s team outfitted the sub with the only cameras in existence capable of withstanding that pressure to show the world what’s down there. On the page describing National Geographic’s 12 current Explorers In Residence, Cameron is identified as a “filmmaker/inventor.” What else would you call him? In light of the fact that Cameron piloted that single-seat sub on its historic March 26, 2012 dive to “Challenger Deep,” becoming the third person in history to touch down, and the only one ever to do it in a solo descent, add “adventurer” to his already precariously hyphenated job title. Deepsea Challenge 3D is an unabashedly hero-worshipping but still robust and involving National Geographic documentary about the years of privately funded research, development, and testing that culminated in that historic feat. It’s so high on the thrill of discovery that it might even win over people who can’t stand the guy. Unlike in Cameron’s prior 3-D underwater documentaries, Ghosts Of The Abyss and Aliens Of The Deep, the director is very much the subject here, providing the voiceover narration and appearing on camera more than ever before. (Though it’s the first of his underwater docs that he didn’t direct or co-direct himself.) There’s even a child actor on hand to portray the prepubescent Cameron in brief reenactments, pretending to dive to 20,000 leagues in a Nautilus fashioned from a refrigerator box. 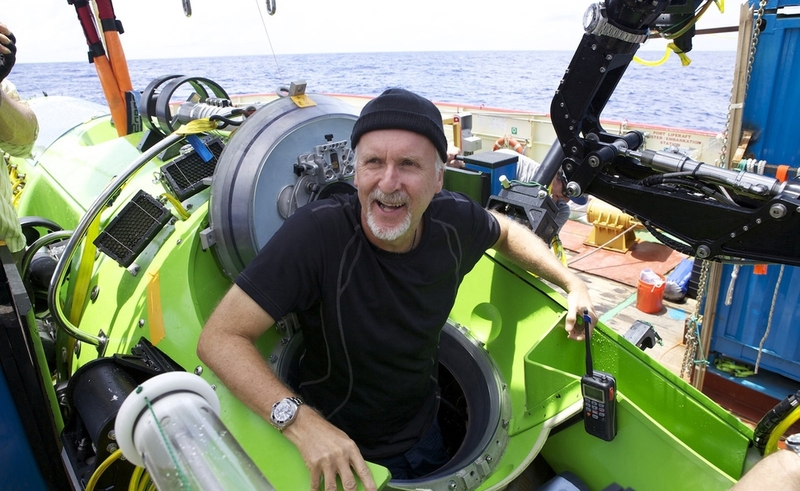 Deepsea Challenge doesn’t exaggerate when it paints the High Priest Of The Na’vi as a real-life Steve Zissou. In the 16 years since Titanic became an Oscar-sweeping, record-breaking global smash, Cameron has devoted at least as much time to oceanography as to feature filmmaking, exploring and filming the wreckage of the real-life Titanic and the German battleship Bismarck. It was during the latter expedition, in 2002, that Cameron and Allum began kicking around the problem of how to build a sub that could dive to full ocean depth. Deepsea Challenge manages all this table-setting in its efficient first third. (There’s a tantalizingly brief clip from The Abyss that’ll have Cameroids begging to fork over $16 for a 3-D rerelease of that underrated science-fiction homily.) When the film picks up in 2009, Cameron and his team are already building the sub Deepsea Challenger in Sydney. The film interweaves the vessel’s long, frustrating development and testing phase, including dives in ever-deeper waters, with the tale of the first two men to reach the bottom of the trench: U.S. Navy Lt. Don Walsh and Jacques Piccard went down in an experimental Naval bathyscaphe in 1960, but their primitive ship had no means of photographing the site, or collecting samples. Their dive is re-enacted, which isn’t especially necessary, since the real-life Walsh, now in his 80s, also appears in the film. He joined Cameron aboard the Mermaid Sapphire, the research ship from which the Deepsea Challenger launched in the Western Pacific. The purpose of the dive, and the film about it, Cameron says, is to call attention to the need to explore and protect the world’s oceans. But those looking for the ecstatic filmmaking of, say, Werner Herzog’s nature documentaries are barking down the wrong thermal vent: Over a shot of a deep-sea dweller that looks stranger than any fictional creature Cameron has ever put onscreen, he says, “I feel privileged to bear witness to the imaginative genius of evolution.” He’s content to let the film’s aesthetic wonders belong to Mother Nature alone. The actual storytelling is workmanlike in the best sense: engaging and accessible to any 8-year-old with an interest in science. Perhaps in deference to that audience, Deepsea Challenge only briefly touches on a tragedy that occurred during its production: Andrew Wight, credited as one of the documentary’s two writers and three directors, perished along with underwater cinematographer Michael deGruy in a helicopter crash while working on the film. There’s a scene of Cameron rhetorically asking an offscreen interviewer if the suffering of the dead men’s families outweighs the benefit of the mission. But the crew resolves to press on, and soon Cameron is back in the sub doing something he’d swore he wouldn’t: launching at night, in a choppy sea, without one of the Deepsea Challenger’s critical safety systems operational. The Mermaid Sapphire was due back in port, and he couldn’t wait for more favorable conditions. Obviously, he survived to tell the tale. Deepsea Challenge 3D could stand to have more of the underwater footage Cameron captured during the three hours he spent at the bottom before multiple thruster failures forced him to return. The film is 90 percent how Cameron and his team got to the bottom, and 10 percent what he saw there. A title card explains that the sediment samples Cameron collected have led to the identification of more than 100 species of microorganisms previously unknown to science, but that isn’t as visually compelling as, say, a moment from an earlier test dive in the New Britain Trench, when a swarm of piranha-like creatures devours a bait chicken so completely, the bird’s skeleton looks like it was steam-cleaned. But that’s how scientific advancement works: It takes years of sweat and disappointment to nudge the frontier of humankind’s knowledge back by a centimeter. Deepsea Challenge is an accessible, briskly paced celebration of that commitment.